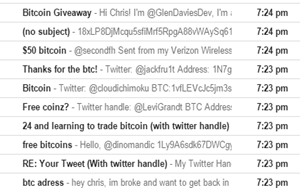 Well, last night I created a bit of the frenzy on twitter when I started giving away Bitcoin. I initially gave $50 to a broke 17-year-old kid who was hungry to trade. Then I announced that I was gonna give the first 10 people that emailed me $50 worth of Bitcoin to help them start trading. Well aside from feeling good after drinking a couple delicious Belgian style beers, I was taken back by the incredible stories I was reading. Guys and ladies from all over the world were telling me of their aspirations to build wealth and trade Bitcoin. I also heard the frustrations people have with the limitations of trying to trade other markets. In many cases these people didn't have enough to trade stocks or futures, or they were in an area of the world that limited their options. A lot of the stories reminded me of when I first started trading when I was 16 or 17. If it hadn't been for a mentor who took me under his wing and gave me my first introduction to the stock market, I wouldn't be where I'm at today. My motto is “build wealth, live well, and give back”. And I couldn't think of anybody better to give back to then young people were driven to have a better life outside of some dead-end job. Bitcoin has been one of the most interesting markets I've ever traded. The “underground community” of traders, miners, tech geeks, and digital currency entrepreneurs is the most progressive and inspiring group of people I've met. My favorite thing about trading Bitcoin is that it brings down all the barriers to entry. There's no government red tape or application process to open a trading account, you don't need at least $25,000 today trade, and you're not pitted against high-frequency computer algorithms and Wall Street market manipulators. It's crazy to think that I only started trading Bitcoin about 18 months ago. As I laid out in my last blog post here, my trade predictions have been ridiculously accurate. I attribute most of this to the fact that there is a lot of “dumb money”, which makes it fairly easy for discipline traders to make money. And after a lot of arm twisting from my partner Anthony, he convinced me to test training small group of people they wanted to learn how to trade Bitcoin like me. We are now four months into our Bitcoin trading Academy test and the feedback from the group has been nothing short of phenomenal. I get daily feedback from our traders saying how much there trading is improved since going to the training and focusing on looking for the highest probability setups. I'm so excited about where Bitcoin and digital currencies are headed. Just a few days ago the first Bitcoin ETF got approved for trading, today the first publicly traded Bitcoin exchange was listed in Canada, and Wall Street money is pouring into the digital currency space. In my predictions for 2015 I said that many Bitcoin exchanges will go away, which is proved to be true so far this year. Unfortunately there are been a lot of hacks of exchanges, so it's good to see the cream rising to the top with the good exchanges becoming insured and getting backed by Wall Street. I've said it before and I'll say it again – I'm a trader first, not a Bitcoin cheerleader. You won't see me telling people to buy and hope “for the moon”. But I do believe in the idea of how digital currencies are going to change financial services, and provide basic banking services to the billions of people that are currently suffering. This includes people in first world countries who've accepted there's no problem transacting in a fiat currency that has many potentially fatal flaws. Here's to trading smart, improving every day, and changing the world for the better!